Introduced in 1993 by the WHO (World Health Organization) and the Harvard School of Public Health, the Mediterranean diet has become a sensation since it’s introduction at a conference in Cambridge MA. It has widely been considered as the ‘gold standard’ for the promotion of longevity and good health. 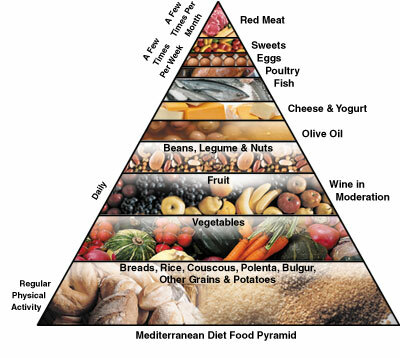 The pyramid structure of the diet represents the healthy traditional Mediterranean diet found in traditional places such as Greece, Crete and Southern Italy in the 1960’s where life expectancy was among the highest in the world even though medical services were limited in these areas. The diet is closely related to the tradition of areas that produce olive oil. It is referred to as the ‘Traditional Mediterranean Diet’ which was used in the region at the time. Pre-diabetic Diet : Is That Necessary?